From the logistic perspective, the main master data are customer master data and vendor master data. The first thing we learn in S/4HANA is customer-vendor integration (CVI) which is also called business partner. As we know in SAP ECC solution both customer and vendor master data divided into three views. Both are the business partner but there are many business partners thinks of real estate sector, who is the business partner for them. The lender is a business partner for them. All of them might not need sales data, finance data or purchasing data. The might need the different set of data. The new dimensional module like CRM, SCM, SRM need the more integrated view of all business partner. The old model for having one particular model for customer and one particular model for vendor no longer holds good for these new dimensional modules. 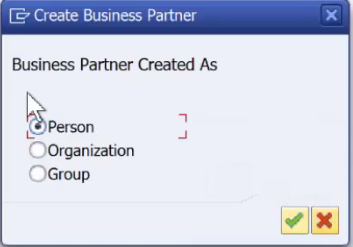 So SAP has created a shell around customer and vendor data called Business partner. First, we created a business partner where basic data like name, address etc., stored and then if we want to extend this business partner as a customer/vendor we extend the Role of that business partner to customer/vendor or both. Business partner is not new in S/4HANA it is there even before S/4HANA. The only difference is in S/4HANA is that business partner is mandatory. It is a prerequisite. ‘BP’ remains there but transaction for customer XD01, VD01, FD01, and vendor created Xk01, Fk01, Mk01 are obsolete. When you try to create customer or vendor with these transactions the system redirects you to transaction ‘BP’. The main difference in S/4HANA is ‘BP’ is mandatory. The first step to creating customer or vendor is through the creation of business partner. The transaction to create business partner is ‘BP’. There are three ways you can create a business partner. These are called business partner categories and they are hard coded. You create a business partner with basic data. Then this business partner extends to customer or vendor. How do you do that you go to change mode and add a BP role? IN S/4HANA world Business partner is a mandatory function. Any time new business partner created data store in this table BUT000. There is no customer/vendor it just a business partner with some basic details. You might be thinking of a question. what will happen to all the existing data, all the existing data for customer master, vendor master etc. what happens to data stored in these tables? The goal of S/4HANA is not to fail the program, in fact, its emphasis is to bridge more simplified word meaning compatibility is major criteria. So everything that works in old ECC will work for new world S/4HANA. That means data should be stored in these tables or new views should be created. So that data could be stored in these tables. When you created Business Partner (BP) the table BUT000 represent the data either in customer/vendor general data. There is no data stored in general, finance and purchasing view of the table. That is why we call business partner as a shell. So how data stored in these tables (in a case as a vendor) General view- LFA1, Finance View- LFB1, Purchasing view –LFM1. When we extend the business partner as a vendor we add a role to business partner let say FLVN00- Finance view as soon we extend the business partner this role the data also store in General view- LFA1, Finance View- LFB1, of vendor master and also vendor get a number different to a business partner. We add another role FLVN01- purchasing view we get the data filled in Purchasing view –LFM1 table. The same criteria apply to customer master data tables. The key difference to note is business partner has a different number as oppose to when you extend particular business partner to customer/vendor number. I am not sure what you mean by –The key difference to note is business partner has a different number as oppose to when you extend particular business partner to customer/vendor number. You just need to mantain the proper settings. what i mean here when we create BP it has a number which is different when we assign a new role to the BP like extending to customer or vendor the extended customer/vendor has a unique number. Thanks for the post. It is very useful. can you please also clarify how we can control suppress/optional/required features based on account groups or Business Partner Groupings. Is it only possible to control field status via BP roles / types? I am involved in a Greenfield S/4 implementation and this is a very big concern for us at the moment as there is a definite requirement to control field statuses based on different account groups. Appreciate your help!